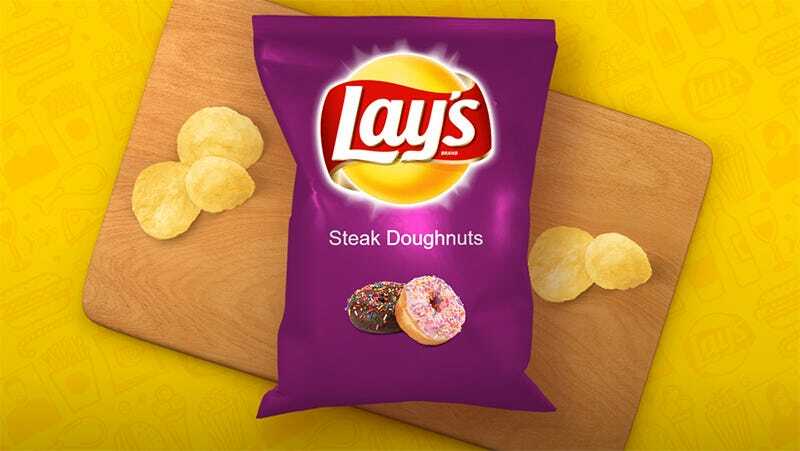 The Lay’s Do Us A Flavor contest returns for a fourth year, once more offering budding snackologists who come up with a halfway edible new potato chip flavor a million dollars. Previous winners include the obvious choice, the bad one and I wasn’t paying attention. After skipping a year to perform a Flavor Swap operation, Do Us A Flavor returns once more, this time asking chip flavor creators to pitch their taste combination like some sort of performing Lacheys. Chip creators are urged to go to the Lay’s website to create a pitch, selecting flavors, choosing bag color and style and even submitting YouTube videos and images to help round out their presentation. My submission, Steak Doughnuts, seemed fine to me, but I got an email saying it was not accepted after I submit my entry. Maybe they didn’t like my video. Flavor submissions are being accepted until March 19, after which four or so finalists will be chosen and featured in a Snacktaku tasting video. That’s not an official Lay’s thing, it’s just what I do. Then Lay’s selects the tamest, most obvious entry and gives its creator a million dollars. I bet this year it will just be Potato favor.